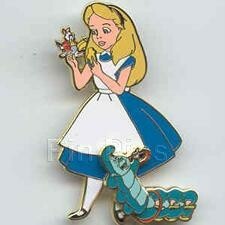 Disney Alice in Wonderland pin pins. WDW - Mickey's Super Star Trading Team (Alice) 3D/Movement This limited edition pin on pin design released from WDW as part of Mickey's Super Trader Team features Alice in Wonderland welcoming the Caterpillar to Mickey's Super Star Trading Team, and it looks like she's just traded for a pin of the White Rabbit. The Caterpillar is a pin on pin with movement. Courtesy of pinpicks site.